So, have you seen the latest and greatest product in helping you make sure your laundry smells fabulous? I have found the perfect one for me its the Purex Scent Splash! This is an in-wash fragrance booster, in a liquid form, so even if you use perfume free detergent this can add a great scent to all of your laundry. What I like the most about this is the way you can customize the scent of different clothes. I know I like the strong scents that make a statement but, my husband, he is not so much into that stuff. He wants it to smell good and clean just not fruity, floral or like a rainforest. So for me, the Lavender Blossoms is perfect and of course since the lavender smell helps with sleep, this is a great one for your sheets and blankets! He prefers the Mountain Breeze scent. So his stuff I put his mountain breeze in mine I put the Lavender Blossoms, good thing we wash our clothes separately. When Destini was a baby we all had to use scent free laundry soap and that was fine, her skin broke out with eczema if she has perfumes, but now I have found that I love the cleaning power of the scent free detergent, however I also love having my laundry smell good. I missed it. For some reason in my brain when something is clean it should smell clean and with scent free, I never quite got the same feeling of my laundry being done. Purex has found a way for you to get clean clothes, and to have them smell fresh and lovely without having to sacrifice anything! I think its great! I know for me it works and I know for everyone I tell about this product they are just over the moon about it. You can’t change the fact that you have to do laundry, but now you can change how your laundry smells when you do it. 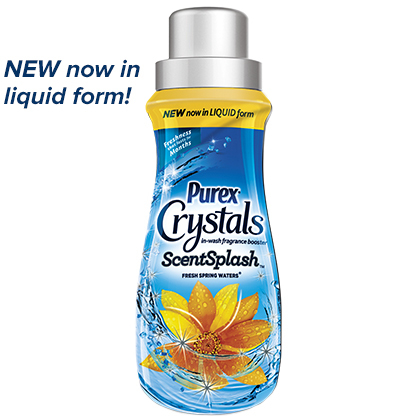 Try some of the new Purex Scent Splash, I think you will like it as well!